Glow Games – Page 2 – ActiveDark.com – Glowing Ideas! Night Sports and Glow in the Dark Games are starting to really gain in popularity. Almost any childhood game can be altered into a glow version of the same game. Here are some our own ideas of fun time games that have been adapted to incorporate some glow! Light Up LED Glow Sports! What can be better than a good game of catch with a couple friends and family? Why, a good game of GLOW catch at night, of course! Check out these cool LED Glowing Soccer Balls, Lighted LED Footballs and Light Up Glowing LED Basketballs. Now you can keep that game going well after the sun goes down! All of these ultra bright glowing sports balls come with additional LED/Battery Inserts AND the batteries can also be replaced in each individual insert – so, how cool is that? Simply press in the button on the side of the LED sports ball and watch it light up with a bright orange glow, easily remove the central insert when the power runs low and pop in a new one! Here are a couple fun videos of these super bright Light Up LED Sports Balls in action! In this fun glow in the dark game, one person plays the ‘traffic light’ and the rest act as ‘drivers’ who will attempt to tag him or her. At the start, all the players (drivers) form a line about 15-20 feet away from the traffic light. The traffic light then faces away from the line of drivers and holds up a Green Glow Stick indicating a ‘green light’. At this point the players are allowed to move forward towards the traffic light. At any point, the traffic light player may suddenly hide the Green Glow Stick and instead display a Red Glow Stick indicating a ‘Red Light’. If any of the players are caught moving after this has occurred, they are out. Play resumes when the stop light hides the Red Glow Stick and displays the Green Glow Stick again. The traffic light wins if all the players are out before anyone is able to touch him or her. Otherwise, the first player to touch the traffic light wins the game and earns the right to be the traffic light for the next round. Played like a regular game of Red Rover, only using 22″ Glow Necklaces to form a ‘Glow Chain’ instead of players holding hands. 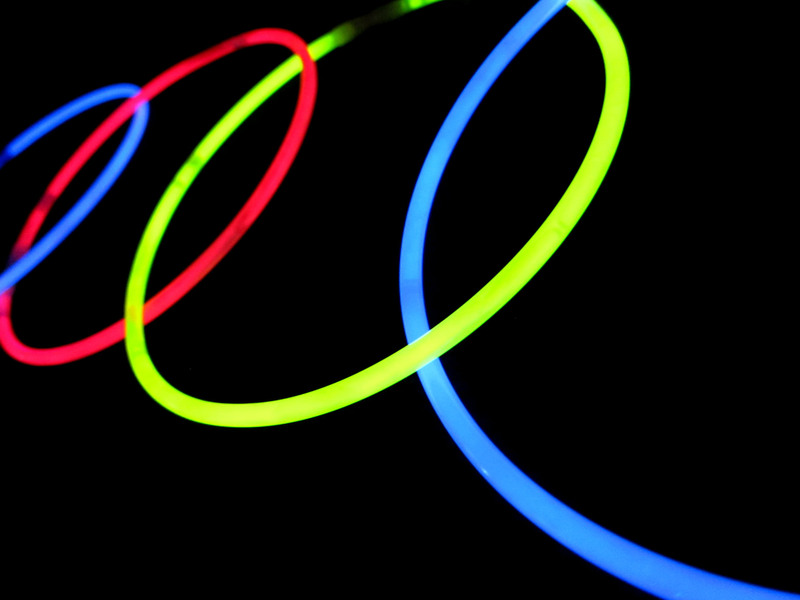 As an alternative, 8″ Glow Bracelets can also be used to create a tougher glow chain. Depending on the size of the group, take several 22″ Glow Necklaces and attach them together into a large chain like effect. Create two of these long glow ‘chains’, divide the group into two equal teams and have both teams spread out into a line facing parallel to each other. Each team takes a chain of glow necklaces and spreads it out across their line, have each team member spread out from one another and hold the glow chain rather than each others hands. The team chosen to go first calls for a runner from the other line by chanting “Glow Rover, Glow Rover, send Johnny on over!” Johnny then takes off running and tries to break through the opposing teams glow stick chain. If successful, Johnny can then claim one ring of the opposing teams glow chain and take it back to add it to his own teams chain. Each team takes turns doing this until one teams glow chain is close to depleted and the others is overflowing with glow. The team with the most glow wins!